Greetings! I’m Matt Chapple and welcome to cnyflyfish.com! 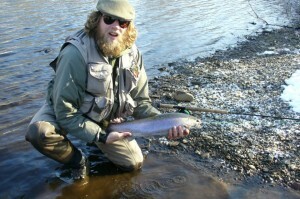 I started cnyflyfish.com in 1995 because of my passion for fly fishing education and conservation. I grew up in Syracuse New York. Fishing has been a part of my life since I can remember. My Uncle started teaching me fly-casting on his pond in Ithaca when I was about eleven. Shortly after that my Grandfather started to take me on fishing trips. We fished for brookies in the southern Adirondacks in small streams, lakes and beaverponds. He taught me how to swing a wet fly on a downstream cast so it would travel under alder bushes, over boulders and through pocket water and started to teach me how to present dry flies. My Grandfather also began to teach me the art of fly tying. The first fly I remember tying was a red ant. It was just red yarn wrapped in two clumps. I used it to fish for brookies and It was very effective. As I gained experience my father and grandfather started to take me to bigger water. My father would take me to tug hill plateau north of Syracuse New York and around the Syracuse area to fish a variety of streams for browns, rainbows and brookies, fishing mostly dry flies and wet flies. Through my teen years I continued to fly fish for trout north of Syracuse in the Tug Hill Plateau, in the East Branch of Fish Creek, Salmon River(above the Reservoirs), Mad River and many other smaller trout streams gaining experience with dry fly presentation and wet fly swinging. My family moved to the Utica area in 1985 and I began to explore the West Canada Creek and other local streams, where I learned more about Mayfly, Caddisfly, and Stone fly hatches. The West Canada has a variety of hatches of both Caddis flies and Mayflies and a nice population of stoneflies. I attended college at SUNY Cortland were I obtained a BS in Biology in 1990. After graduating from college I began to learn “no indicator” nymphing techniques and streamer fishing for lake run rainbows, browns, and landlocked salmon in the Cayuga Lake tributary system. In the early 90’s I began to explore the Lake Ontario tributary system, fly fishing the Salmon River and some of the smaller creeks of the eastern basin targeting Steelhead mainly. I also enjoy spey casting techniques and the swinging style of presentation. This has become my favorite way to catch steelhead. My scientific background has helped me in my fly-fishing endeavors. I am very interested in entomology and ecology and the life cycles of Trout, Salmon, and their food. Over the years I have tried many different patterns on the rivers and streams throughout central New York attempting to discover new ones that catch fish. Fly-fishing has been such an enjoyable part of my life that I thought it would be fun to teach and help others to enjoy this wonderful sport. So, I obtained a license to guide in New York along with a boats and canoe license, which enables me to take people out to the streams and rivers to introduce them to some of New York’s trout and salmon inhabited waterways.